A few days ago, I attended a meeting, organized by the Climate Change Division of the Ministry of Economic Growth and Job Creation. Towards the end of every year, this seminar highlights the key issues of concern for Jamaica (as part of its negotiating group of island states, AOSIS) as they go off to the “COP” (the Conference of Parties to the United Nations Framework Convention on Climate Change, the UNFCCC). Yes, there are many acronyms involved, but we will try to break these down. These Parties are the 195 countries that signed on to the Convention. This year, COP-24 will take place in the chilly midwinter of Katowice, Poland. The Jamaican delegation has packed its woolly hats and scarves and some thick boots…but will most likely spend many hours a day in overheated meeting and hotel rooms. 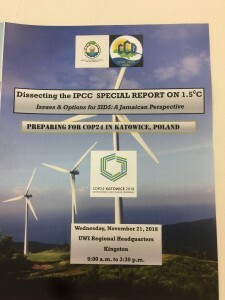 The session at the University of the West Indies (UWI) Mona campus began with a “Review of the IPCC Special Report on 1.5 Degrees” by our esteemed Professor Michael Taylor, who heads UWI’s Climate Studies Group. What on earth is that you may ask? Well, the IPCC is the Intergovernmental Panel on Climate Change. It’s a remarkable entity, founded by the United Nations Environment Programme and the World Meteorological Organization in 1988. The IPCC has nothing to do with politics, and everything to do with science. Thousands of scientists around the world contribute to regular reports on the state of climate change (including Professor Taylor himself, who is a Lead Author). The latest report, on how an increase of 1.5 degrees Celsius will impact global economies, public health, livelihoods and more, makes for grim reading. However, I will write more about this. A presentation by panellist Eleanor Jones struck me as significant. Ms Jones is Managing Director of Environmental Solutions Limited and a member of the Private Sector Organization of Jamaica (PSOJ) and the Jamaica Institute of Environmental Professionals (JIEP). It might surprise you to know that more often than not, no private sector member is invited to join Jamaica’s delegations to the climate change conference. The private sector was invited to a COP for the first time, just two years ago. It must be on the same page with the government, or we are (literally perhaps) sunk. The private sector must be completely won over by the Government technocrats, and everyone. These would-be partners must explain to business people that taking the path to sustainability makes sense – because they will ask the basic question: “How does climate change affect my bottom line?” This applies to small businesses as well as the “big boys” – and I suspect the challenge of persuading small and micro businesses might be greater than with the larger companies that can afford to take big, bold decisions. 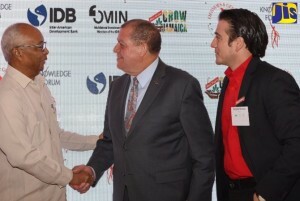 Last week, a public-private sector “knowledge-sharing forum” took place hosted by the Desnoes and Geddes Foundation in collaboration with Red Stripe Jamaica. At this meeting, Red Stripe Managing Director Ricardo Nuncio talked about the company’s Project Grow, which has contracted 87 farmers in St. Thomas to boost the production of cassava. This crop will soon constitute some 15% of the company’s beer products. Not only does the project provide reliable income for these farmers and their families, but also reduces the costs associated with imported raw materials. We forget that transportation (by sea and air) contributes to climate change in terms of greenhouse gases (GHGs). Speaking of “GHGs,” Red Stripe is also the first Jamaican commercial company to be fully LNG-powered, reducing those emissions by approximately 6,000 tonnes per annum. 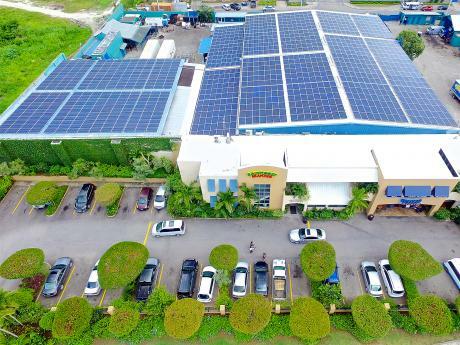 Rainforest Seafoods’ solar panels in Montego Bay. There are many other examples of the private sector beginning to “see the light” on climate change and sustainability: earlier this year, for example, Rainforest Seafoods announced that it would double its solar capacity, achieving over 1.5 megawatts of solar power at its main complex in Montego Bay and its Kingston plant. Rainforest has already implemented a number of conservation methods in terms of energy efficiency. This environmentally aware company does not sell parrot fish and is conscious of unsustainable fishing methods. 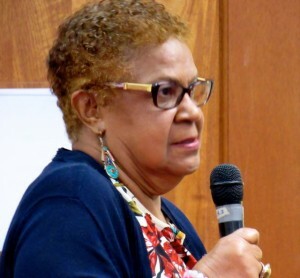 So, says Ms Jones, we must move environmental issues, sustainability and climate change concerns from being a “cause” (which is how advocates like myself and others have seen it for some years now) to a “purpose.” For the private sector and all of us – it must be about taking action. Urgent, concerted action. A Green Economy Scoping Study was completed last year and you can read it here. So, I now look forward to writing about the purposeful, sustainable actions that are being taken, rather than continuing to plead for causes! “We must bring everyone together,” Ms Jones urged. In light of Professor Taylor’s presentation, it would seem that this must happen today, and from henceforth, with enlightened leadership and a sense of real urgency. The private sector must be fully on board as we steer our ship through increasingly uncertain and treacherous waters.